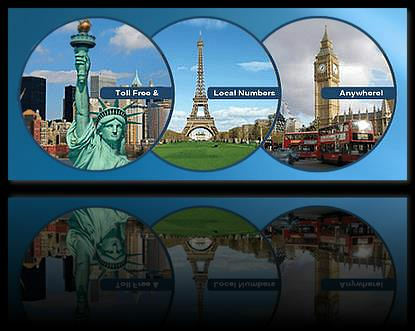 Get a toll free or local phone number that automatically forwards calls to a phone number in any country. You can now have your own, private telephone number that automatically forwards calls to your telephone number located anywhere worldwide. Set up a number that rings to your phone for your associates in another country, a family member or direct sales calls or customer service inquiries to a call center. Now businesses like specialty olive companies in Spain, mahogany artisans in Honduras or even caviar distributors in Murmansk can advertise a toll free or local virtual number in the media making it easy for lucrative markets to respond and communicate. You can own a call forwarding number and distribute it to your global clients and associates. A follow me phone number is a virtual phone number that you can configure to follow you from one phone number to another, regardless of country location. Callers who dial your follow me phone number are routed to whichever phone you’ve designated such as the phone at your office. You can even configure the number to follow you. For example, if you don’t answer the phone at your office desk in a certain number of rings, the call could be forwarded to your next designated number such as your mobile phone. When you order a follow me phone number, you make it easier for callers to reach you no matter where you might be. If you’ve ever been frustrated by having to dial multiple phone numbers to finally reach someone, then you can understand how your callers might feel if you too have multiple phone numbers. Instead of asking callers to first try you at the office, then at your home office, then at your mobile phone, and so on, simply provide them with a single follow me phone number. Depending on your preferences you can either configure specific call routing routines or change the ring to number on the fly as needed. It can also follow you internationally. Simply change the ‘ring to’ number by logging into your account and modify the ‘ring to’ number to your international phone number and your calls will be redirected internationally to any phone - in any country to a mobile, landline, fax, PBX or VoIP. While you likely have a mobile phone, many professionals prefer not to give out its direct phone number. After all, incoming calls consume valuable minutes and it’s frustrating to take a mobile call when sitting at a desk with a perfectly functional landline. In addition, when callers have your mobile number, you have less control over your phone hours. With a follow me phone number, you can receive calls on your mobile phone when it’s practical for you. When it’s not practical to receive calls at all, you can configure your virtual number to ring directly to voicemail by using the ‘do not disturb’ option. You could even have those voicemail messages routed to your email address if desired. Follow Me Virtual Numbers are designed to allow businesses abroad to remove the communications barrier and become accessible to markets in the United States, Australia, Canada, Belgium, France, Hungary, Italy and Ireland, New Zealand and the United Kingdom. Your virtual Toll-Free or local number can ring to any telephone, fax, VoIP number. If your telephone line has a rollover sequence, the virtual number will also rollover to any available line. If you do not have extra extensions, we can give you extra roll over lines on our switch. "Finally, one US toll-free number that I can change on-the-fly to reach me on either my US *or* any worldwide location I happen to be at. The convenience and transparency of having one number that can instantly be changed (via the web) to link with any of my various locations far outweighs the cost. In fact, before leaving the States, I'm now able to forward (*72 + my number) from my US mobile to my Global Virtual Number, which I then set up using your web interface and change it to any number I choose. Thus, my whereabouts will now be transparent, and folks in the US can call my regular US cell number. Great ! " In addition to these countries listed below, if you need to divert calls to a number in a country that is not listed below, if you know the phone number and it is functional, our system will divert your calls there.